Kaiser Leuchtstofflampe 2148. 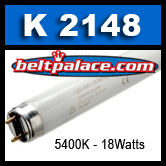 18W, 5400K Fluorescent lamp for Kaiser 2062, 2192, 2196, and 2462 Photographic copy stands. Kaiser Leuchtstofflampe 2148. 18W, 5400K Fluorescent lamp for Kaiser 2062, 2192, 2196, 2462 copy stands. Fits other models with correct pins and wattage requirements. CLOSEOUT ITEM! We only have 2 left in stock. All sales final.